The rangefinders are indispensable aids in spot bowling. bowling is that it is a lot easier to hit a target that is ten or fifteen feet in front of you than one at the other end of the lane, about sixty feet away. 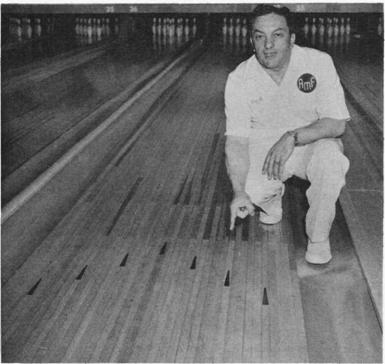 These directional guides or rangefinders, as they are sometimes called, will be found built into the lanes of every modern bowling center. The term”rangefinders” refers to the seven small triangular indicators, spaced about six inches apart, and found inserted in the lane about fifteen feet from the foul line. They are the guides we use in spot bowling. My spot is normally the second target guide from the right. Keep your eyes on the target or spot until after your follow-through has been executed. Generally speaking, in the spot-bowling system, the perfect strike ball is directed over the second rangefinder from the righthand side. It starts hooking at a point about two-thirds to three-quarters of the way down the lane. You should practice rolling the ball over the second rangefinder, and if your delivery is the same each time, you can’t miss rolling up a string of strikes.I recommend the spot-bowling method for both strike and spare shooting. 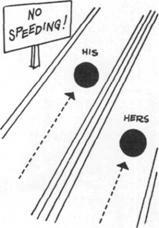 Of course, on your spare shots you’ll adjust your spot each time, depending upon where the spare leave is located. 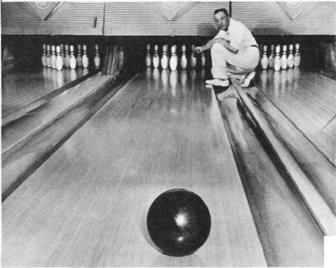 The ball should start breaking towards the pins at a point two-thirds of the way down the lane. It strikes the 1 3 pocket. begins, especially on spare shots. 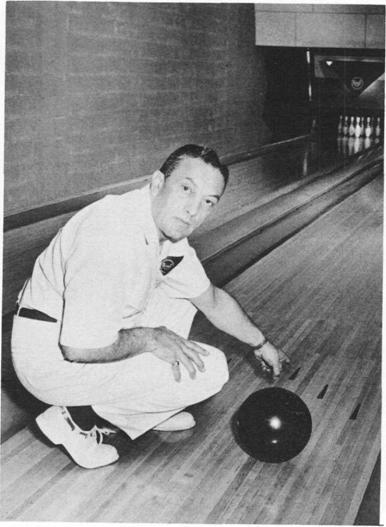 It is called line bowling because, in his mind’s eye, the bowler draws a “line” from the pins to the foul line a line that includes the points over which he plans to roll the ball.Pin bowling is the system used by most beginners. 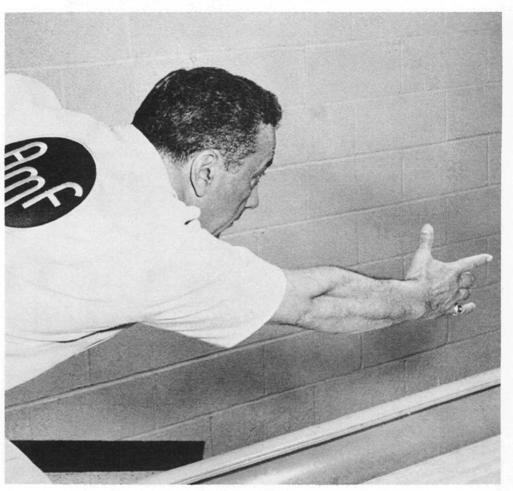 In pin bowling, the bowler aims and shoots for the pins directly without regard to spots or marks, or any type of directional guides. Using this style is a bit of a handicap for the average bowler and I would rather see him practice and use the spot system. It has been proven best by far. This entry was posted on Tuesday, October 25th, 2005 at 10:50 pm	and is filed under Bowling. You can follow any responses to this entry through the RSS 2.0 feed. Responses are currently closed, but you can trackback from your own site.